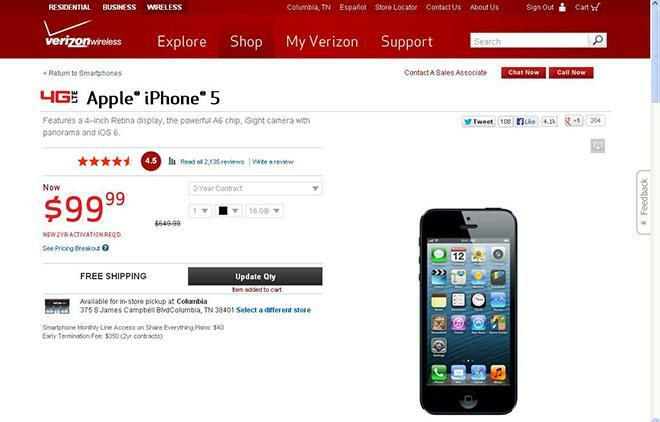 Verizon has confirmed to AppleInsider that the carrier will indeed be offering the iPhone 5 for just $100, but only to select customers as a promotional effort to encourage smartphone adoption. Update: A Verizon representative contacted AppleInsider to clarify the carrier's iPhone 5 pricing. The $100 pricing is not a deal that will be extended to all Verizon customers. It is, instead, an offer for specific customers that are off-contract or within two months of the end of their contract with a featurephone. "It's a promotion," the spokesperson told AppleInsider. "Many of these customers have indicated through usage or wireless purchase patterns that they'd be interested in moving to a smartphone, and this is an exciting price point with an exciting phone." The spokesperson confirmed to AppleInsider that this is not an offer that will be appearing on Verizon's site. Instead, it will be accessible only through the My Verizon pages of eligible featurephone customers. Meanwhile, another source has provided AppleInsider with additional materials that may reveal how Verizon will go about offering the upgrade to featurephone customers. It would appear that the carrier will give the $100 discount via a bill credit for upgrading customers, according to what looks to be a pair of internal communications documents. 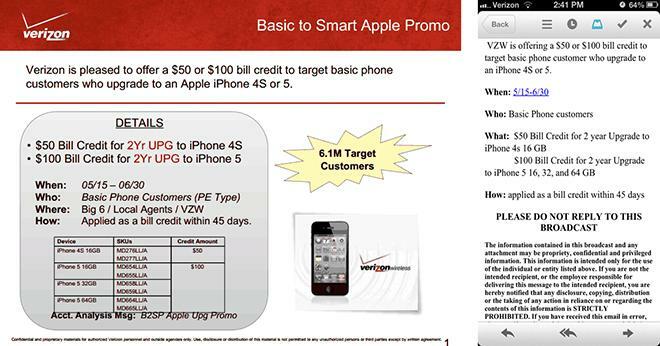 Additionally, Verizon may be offering customers upgrading from a featurephone to an iPhone 4S a $50 credit. The documents indicate that this will be a limited time offer beginning on May 15 and running through June 30, 2013. The bill credit, according to the documents, will be applied to customers' accounts within 45 days. One document, which looks to be part of a PowerPoint presentation, notes that the offer will target 6.1 million customers. That makes up about six percent of Verizon's total customer base. AppleInsider attempted to verify the accuracy of these documents, and a representative for the carrier was unable to do so. On Wednesday morning, Verizon appeared to have jumped the gun on its website, posting the 16-gigabyte iPhone 5 for just $99.99 with the activation of a two-year contract. The price listing was visible for only a short time before reverting to the normal price point, but AppleInsider tipster Nicholas managed to grab a screenshot clearly showing the lower price. AppleInsider contacted Verizon for a response, but a representative for the carrier said that it does not respond to rumors. The iPhone 5 usually sells for $199 on Verizon with a two-year contract. Recent weeks, though, have seen rumors that the carrier was preparing to lop $100 off the cost of Apple's latest smartphone. A $100 price point would give Verizon  the United States' largest carrier  the lowest-costing iPhone 5 in the nation. Sprint also offers the opportunity to get an iPhone 5 for $100, but that is only after a $100 discount for porting an existing phone number to Sprint. T-Mobile debuted the iPhone 5 last month on its network for $99, but that introductory offer has since ended, and the Apple handset now costs $149. Verizon sold four million iPhones  half of which were iPhone 5s  in the most recent quarter, more than half the carrier's smartphone activations for the quarter and about one out of every nine iPhones sold worldwide. That figure was down from the holiday quarter, when Verizon sold 6.2 million iPhones, of which half were iPhone 5 units.